Tin Can Bay is 218 kilometres (135 mi) north of the state capital, Brisbane. The locality of Tin Can Bay is bounded on the east by the Great Sandy Strait, a pristine waterway protected by World Heritage listed Fraser Island. The area is a Ramsar Convention Wetland of International Importance and an Important Bird Area of Australia. The town is located on a peninsula between Snapper Creek and the Great Sandy Strait. Tin Can Bay is the nearest town to the Australian Army's Wide Bay Training Area. The town was originally called Wallu, but was changed to Tin Can Bay in 1937. The origins of "Tin Can" are uncertain, but is believed to be derived from an indigenous name, possibly ''tinchin'' meaning ''mangrove'' in the Yugarabul dialect of the Yuggera language, or '''tinken''' meaning '''vine with large ribbed leaves''' from Doombarah Clan, Dulinbara dialect, Kabi language, or '''Tuncanbar''', thought to refer to the dugongs that frequent the inlet. European settlement began in the 1870s as the point where logs would be floated to the timber mills at Maryborough. Tin Can Bay later became, and still remains, an important fishing port, with a focus on prawns as well as recreational fishing. Wallu State School opened on 1 February 1934 and was renamed Tin Can Bay State School in 1937. The Tin Can Bay Library opened in 1985 and underwent a major refurbishment in 2005. Tin Can Bay was formerly in the Shire of Cooloola until its amalgamation in 2008 into the Gympie Region. At the 2006 census, Tin Can Bay had a population of 1,994. The seaside town is a popular holiday destination. Recreational facilities include hotels, holiday units and caravan parks, with houseboats and yachts for hire and a marina. Active sports facilities include an 18-hole golf course, two bowls clubs, tennis courts and an outdoor swimming pool. The Tin Can Bay Country Club  serves residents and visitors in the Tin Can Bay, Cooloola Cove and Rainbow Beach areas. An important tourist feature is the regular arrival of wild Australian humpback dolphins which usually appear early mornings next to the Norman Point boat ramp. 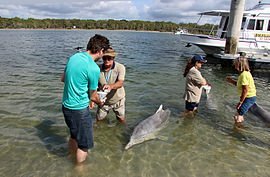 These dolphins can be hand fed under close supervision. Bird watching is another popular activity as Tin Can Bay is home to a wide variety of birds. Each September the town hosts the Tin Can Bay Seafood Festival, a day of family fun, with entertainment, novelty competitions such as mullet throwing and prawn eating, helicopter joy flights over the bay, seafood and market stalls. Other events throughout the year include the Bay to Bay Yacht Race, Dragonboat Regatta, Cooloola Coast Flower Show and the Foreshore Family Carnival from Boxing Day to New Year's Eve. The Gympie Regional Council operate a public library at the park on Tin Can Bay Road. There is an excellent public boat ramp into Snapper Creek with boat-washing facilities and ample trailer parking. A vehicular ferry operates at nearby Inskip Point providing access to Fraser Island. The Tin Can Bay branch of the Queensland Country Women's Association meets at 18 Whiting Street. ^ a b Australian Bureau of Statistics (31 October 2012). "2011 Community Profiles: Tin Can Bay (State Suburb)". 2011 Census of Population and Housing. Retrieved 20 October 2014. ^ a b "Tin Can Bay - town (entry 44159)". Queensland Place Names. Queensland Government. Retrieved 19 July 2015. ^ "Tin Can Bay - locality (Gympie Region) (entry 46386)". Queensland Place Names. Queensland Government. Retrieved 19 July 2015. ^ "Tin Can Bay - locality (Fraser Coast Region) (entry 46751)". Queensland Place Names. Queensland Government. Retrieved 19 July 2015. ^ "ANTIGUA". The Courier-mail (1097). Queensland, Australia. 6 March 1937. p. 7. Retrieved 19 July 2016 – via National Library of Australia. ^ "Tin Can Bay". Walkabout Australian Travel Guide. Fairfax. Retrieved 2007-05-25. ^ "Opening and closing dates of Queensland Schools". Queensland Government. Retrieved 19 July 2016. ^ "Public Libraries Statistical Bulletin 2016-17" (PDF). Public Libraries Connect. State Library of Queensland. November 2017. p. 13. Archived (PDF) from the original on 30 January 2018. Retrieved 30 January 2018. ^ Tin Can Bay Country Club. ^ ""Along the Bird Trails of Cooloola" - "Tin Can Bay Foreshore Bird Walk"". Retrieved 17 July 2016. ^ "Seafood Festival a real feast". Gympie Times. 24 September 2015. Retrieved 20 July 2016. ^ "Library locations". Gympie Regional Council. Archived from the original on 31 January 2018. Retrieved 31 January 2018.